Location really can play a big part in your business especially if you are running a café bar! This cracking café bar faces the water´s edge of the working port of Fuengirola – one of the only working ports left on the Costa del Sol. It has stunning views of the boats and there are plenty of water sports and boat trips to be had here which adds to the constant flow of people that this area sees all year round. The café bar has been established for many years, has an excellent monthly rent and is 90 m2 inside with a 40 m2 sunny terrace. The terrace is split into two areas so it can provide sun, shade and shelter depending on the weather and has a mixture of furniture to include Rattan sofa style seats, dining seats and wicker style – something for everyone whether they want to eat or drink. This is a great area to watch the world go by for tourists and is a great area for the workers to have lunch. Inside the main café area there is again a selection of seating to include bar stools and this whole area has a great sense of community spirit and is very welcoming. The bar is located to the right and is of a good size having a mass of rear shelving on the back bar for all your display and storage requirements. The bar is fully equipped and can serve anything from coffees to cocktails. The kitchen is located to the end of the bar and even though it is compact, it is so well laid out and fully equipped that it can easily cope with creating any of the 3 main meals required during the day and night. To the rear of the premises you will find a good sized store room ideal for extra stock, 2 bathrooms to include one for disability use and a further raised seating area. There is also a rear exit/entrance to this premises which is perfect for receiving deliveries instead of them passing through the main eating area. This business is stunning, modern and very comfortable and is ideal for a couple to run although it has previously kept a family of four. 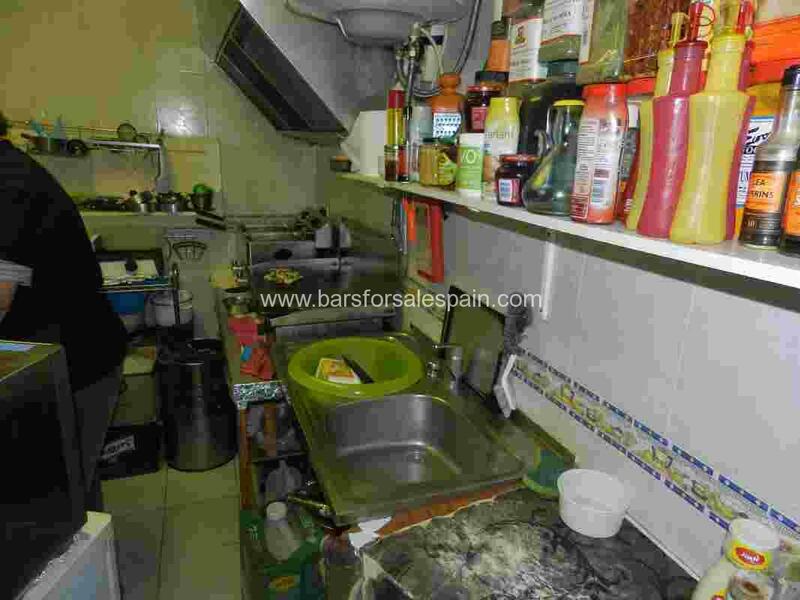 Contact Bars For Sale Spain today for further information. One of The Businessiest Cafe/Bars in Fuengirola, Costa del Sol.